Today in Ankara during the visit of the Head of the MFA of Ukraine to Turkey, Foreign Minister of Ukraine Pavlo Klimkin, leader of the Crimean Tatar people Mustafa Dzhemilev, Ukrainian Ambassador to Turkey Andrii Sybiha met with Speaker of the Great National Assembly of Turkey İsmail Kahraman and President of theTurkish General National Assembly's Foreign Relations Committee Volkan Bozkır, the correspondent of QHA reports. The meeting was also attended by Deputy Chairmen of the Mejlis of the Crimean Tatar people Ilmi Umerov and Akhtem Chiygoz, First Deputy Minister of information policy Emine Dzhaparova and others. The meeting, which began at 10:00, lasted 45 minutes. 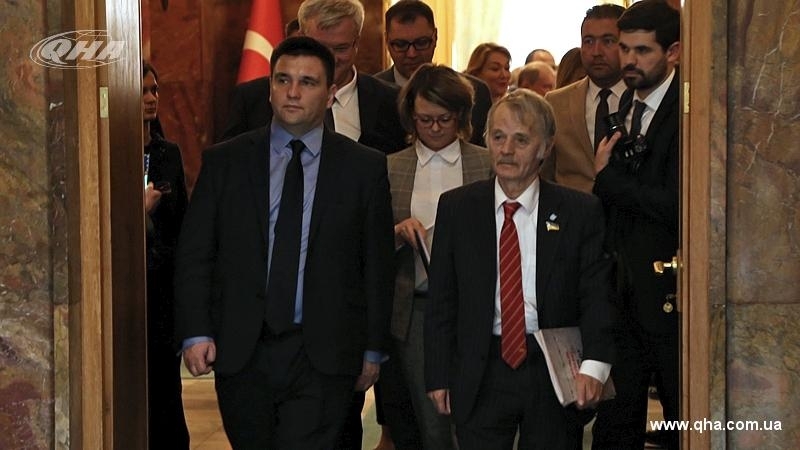 After the meeting, Mustafa Dzhemilev took part in the meeting of the Ukrainian-Turkish parliamentary group. Today, Dzhemilev is holding a number of meetings with the highest political leadership of the Turkish Republic and representatives of the Crimean Tatar diaspora of the country, as well as participating in an interview with the leading Turkish media and in the planned pre-premiere showing of the film "Cyborgs". Earlier, yesterday in the framework of a working visit to Turkey, Ukrainian Foreign Minister Pavlo Klimkin attended the opening ceremony of the renovated consular department of the Ukrainian Embassy in the Republic of Turkey in Ankara. QHA reported that the First Secretary of the Ukrainian embassy in Turkey on consular issues Vyacheslav Khomenko, online registration at the place of residence among the modernizations. Now every citizen at the place of residence can visit the website, fill in the necessary applications, get a full package of documents and make an online registration for a consular action, wherever they are in Turkey.